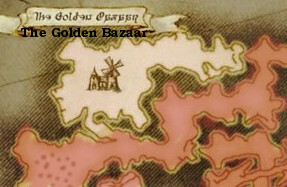 The Golden Bazaar (ゴールドバザー [golden bazaar] in Japanese) is a village in eastern Thanalan, just north of Drybone and south-east of the Sea of Spires. 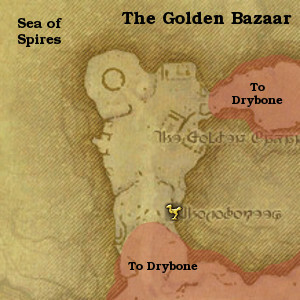 It used to be a rich waypoint for merchants traveling between Ul'dah and Gridania, but as traffic bit by bit relocated further south, the Golden Bazaar came upon bad times. Its residents have become poor and rather desperate, although recent rumors of a mythril vein nearby bring hope of renewed interest in the hamlet for them. To the east of Golden Bazaar the Calamity uncovered the Invisible City, thought to be part of the ruins of a grave monument to an ancient king of Belah'dia. This has done its part in reviving hopes for the future of the village.